PDF format is an easy and convenient way to represent electronic documents and exchange data via the Internet all over the world. However, there are significant difficulties to work with information received in a PDF format for many users as by its nature PDF is not editable file format. Actually, PDF is simply an image of a document, so it is almost impossible to be changed, revised or manipulated without the original access password. But this problem can be easily worked around when you convert PDF format to Word that is far more editable and flexible format. That's why VeryPDF.com Inc. is here to provide you with PDF-to-Office Converter, a high-quality PDF to Office conversion utility designed to make your work with PDF files more convenient and effective. VeryPDF PDF to Office converter is the wise choice for your routine PDF to Microsoft Word document conversion. Now you have VeryPDF PDF to Office converter, it is no longer necessary to reformat or retype your tedious and endless PDF document manually. Use VeryPDF PDF to Office Converter to convert all your PDF documents back to fully-editable Microsoft Word documents. 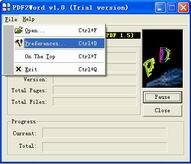 The software can Accurately convert PDF file back to Word. Retain graphics, text formatting, paragraphs, columns, tables, and more in converted office Word document. PDF to Office is a standalone software, MS Word, Adobe Acrobat and Reader NOT required! If you are working with PDF file format, you are probably aware of problems concerned with editing, changing and reusing of PDF documents. Our professional program to convert PDF to Office will help you to eliminate such issues while guaranteeing you high-quality converting process with a minimum loss of formatted information.